If you haven’t been living under a rock, you would have noticed that there are vegans (should I even call them vegans?) that went back to eating meat/animal products. The reason why? According to them, it’s because their health was failing. Apparently, going on a water fast and eating mainly raw fruit is the way to treat your body and maintain optimal health — it isn’t, obviously. It’s common sense to know that you’re depriving yourself of calories and nutrients. I find it very absurd that they blame veganism for ruining their health. I’m not a doctor, but it’s pretty clear that there’s an eating disorder/restrictive dieting going on. They all seem to have something in common. They’re fixated on juice cleansing, detox, raw diets, or whatever the next trending diet is. I don’t think they were vegan to begin with. They used vegan to cover up an eating disorder. What ever happened to eating a balanced, vegan diet? Eat enough food. Eat a variety of foods. If you’re active, you need to eat more food. Not eat less. This is a simple concept. To blame veganism for their poor eating habits, that’s what makes me go *roll eyes*. I have not experienced hair loss on a vegan diet. My nails grow out every week. I can’t believe how fast they are growing! My skin is much better as a vegan. Before being vegan, I broke out a lot more. Now, my breakouts has to do with what skincare/makeup products I use and my period. This isn’t something I want to talk about, but I had to bring this up because I just mentioned it, and it always comes up with so-called ex-vegans. Good news, I haven’t lost my period on a vegan diet. My period has been spot on, consistent. I’m very happy about this!! Pre-vegan, my periods were sporadic. I went to my doctor about this issue during that time. All the doctor did was push birth control pills on me. Pffttt! Hungry all the time… 🤤 ?? No, I am not. I eat when I’m hungry. Stop when I’m full. I don’t plan my meals on a daily basis. I just eat. If I want fruit, I eat fruit. If I want chocolate, I eat chocolate. Yes, vegan chocolate exists! How cool is that? 🍫 I’m also not on a high carb, low fat, high protein, or whatever type of diet. Not on a vegan diet. I became iron deficient when eating lots of meat. I had my blood checked during that time too, so I’m not pulling this info out of thin air. Who would’ve thought? But not on a vegan diet. I do take supplements. Multi-vitamin and omega (algae). I took supplements before I went vegan too. I’ve always leaned towards algae-based omegas over fish oil capsules. The smell of fish oil supplments, to me, are absolutely revolting. Oh, and the fish burps. I do have protein powder, but I only use it a couple times a week. It’s not something I rely on, since I prefer to eat solid food. Also, vegans are not the only ones that take protein supplements. Lots of people that consume animal products do as well! There are more supplements out there for meat-eaters than there are for vegans. Apparently, meat eaters love to say that vegans need an array of supplements, but consume those supplements themselves. As you can see, my health isn’t failing. I eat a pretty normal diet without the cruelty. My lifestyle isn’t bizarre with water fasting, juice cleansing, and whatnot. In my opinion, ANY diet that is very restrictive will eventually lead to a decline in health overtime. It has nothing to do with veganism. Acure Brightening Glowing Serum. Does it Work? Hi! 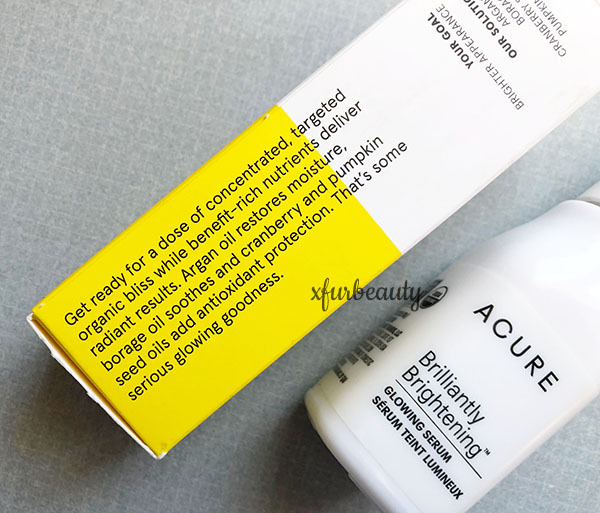 I’ve been using Acure Brightening Glowing Serum for about 6 months. I stumbled upon this serum when I was searching for a natural, moisturizng, and brightening skin care product for my facial skin. 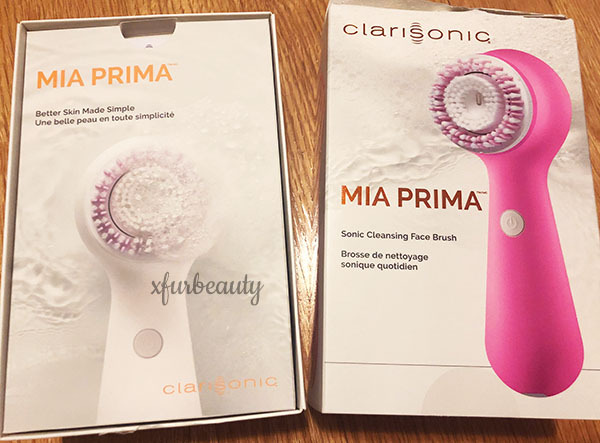 I’ve also used other Acure beauty products before, so I thought I would give this one a try too. The purpose of Acure Brightening Glowing Serum is to restore moisture with Argan Oil, soothe with borage oil, add antioxidant protection with cranberry and pumpkin. The ingredients on the bottle only says with argan oil, pumpkin, & cranberry. Those are the main ingredients they are advertising. On the package, it states that it contains safflower seed oil, sesame seed oil, pumpkin seed oil, borage seed oil, argan oil, sweet orange peel oil, cranberry seed oil, lavender oil, olive fruit oil, and rosemary oil (in that order, as shown in the photo). 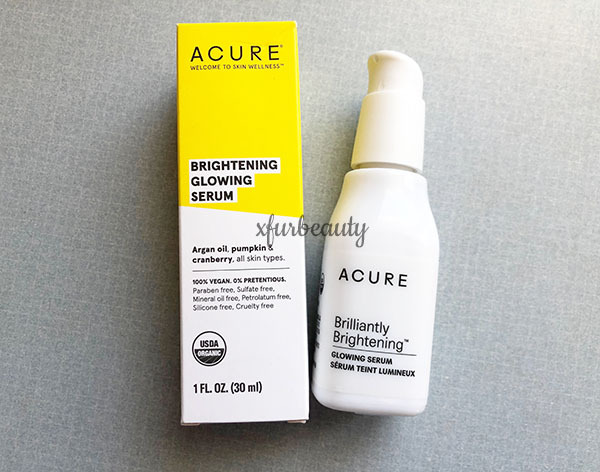 Since I’ve been using it for 6 months, I can give a thourough review on Acure Brightening Glowing Serum. 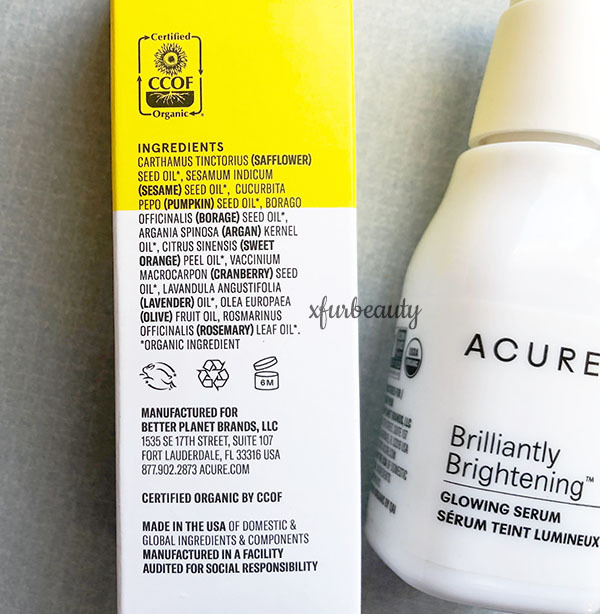 😊 Acure Brightening Glowing Serum calls itself a serum, but it really isn’t one. It’s more of an oil. Just look at the ingredients! It’s full of oils, and it feels like it! It’s not too greasy. It’s lightweight and absorbs into the skin good enough. It does leave the skin looking a tad shiny, but I wasn’t bothered by it. The serum is natural. It’s organic. It’s vegan. And YES! It makes the skin appear brighter! It makes the skin look glowy. So, it works to even out the complexion. It also made my skin feel extra soft and smooth. It’s moisturizing. For months, I couldn’t believe I had found THE ONE! I continued to use it consistently twice a day, everyday. Just a reminder, I do have acne-prone skin that gets shiny. Unfortunately, I couldn’t use it anymore when I noticed that the offender to my clogged pores was because of the serum. It didn’t give me cystic acne, but made me develop tiny hard sebum inside of my pores. I had to give it up ASAP. Even though I loved the results, I couldn’t bare developing acne again. So what happened when I stopped using the serum? 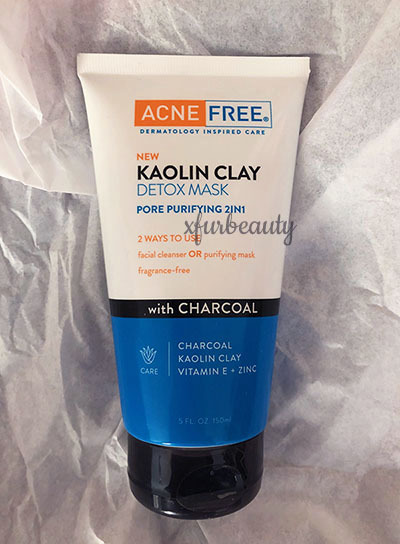 I stopped developing clogged pores (yay!). My skin became dull and dry. 😢 Really, this serum works and does what it’s supposed to do. If you have dry, normal skin that doesn’t breakout, this is a good skin care product to go to. I would use it if I didn’t have acne-prone skin. When I was using this serum, I didn’t have to use any other skin care products. It took care of all of my skin care needs (eye cream, spots on the face, hydration, all-in-one!). Also, it was really good at moisturizing my eyelashes too! My lashes looked longer! !